Advertising agencies just slow Valve down and get in the way of making a good ad. Doug Lombardi, head of marketing for beloved developer Valve, says that advertising agencies are all but worthless when it comes to marketing games, or indeed, pretty much anything else. Lombardi says that Valve was tired of bad ideas from so-called creative agencies, and so for Portal 2 decided that it would make the TV ad itself. Lombardi said that he had had many meetings with advertising agencies in the past, and said that all too often, the treatments they'd come up with were clichÃ©d, or copied other ad campaigns almost note for note. In some cases, he said, he'd even seen pitches where the agency clearly hadn't even been listening in the original meeting. He felt that the best people to try to sell a product were the people who'd made it, which is why Valve had ditched agencies for Portal 2. Aside from not having to deal with the agencies themselves, striking out alone had other advantages, Lombardi said. Chief amongst them was that Valve could be a lot more responsive doing things by itself compared to going through an agency. Valve had been able to make changes to the ad during production as it playtested it. With an agency, there usually wasn't time for that kind of test, and so the feedback ended up as near-useless notes after the fact, rather than being put to use making the ad better. It will be interesting to see Valve's TV spot, not only because it will be the first time that a lot of potential players become aware of the game, but also because it will be fascinating to see Valve's creativity used in a different way. 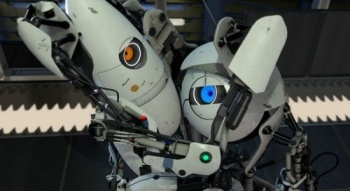 Portal 2 comes out for PC, PS3 and Xbox 360 on April 19th.